Monopoly math problem with a tax - FreeEconHelp.com, Learning Economics... Solved! This post goes over the algebraic methods necessary to solve common economics monopoly problems. We assume that you are given a basic demand function and marginal cost function, and are asked to derive marginal revenue function and find out what the monopoly price and quantity will end up being. First we are probably given either a demand function (solved for Q) or an inverse demand function (solved for P). We need the inverse demand function because this gives us the slope of the demand curve (since P is on the Y axis). Once we have the inverse demand function we can solve for the marginal revenue function by doubling the slope (making it steeper). 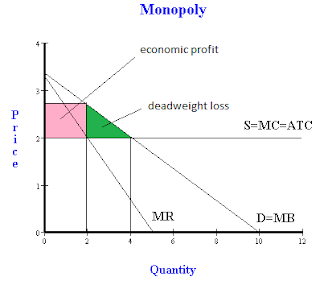 A past post goes over the math behind calculating monopoly equilibrium price and quantity, so I will go over another example really quickly then introduce the idea of combining demand curves and adding a tax into the mix. We now set our marginal revenue function equal to our marginal cost function and solve for quantity to get our equilibrium quantity (remember in economics MB (or in this case MR) always equals MC). So our equilibrium price is going to be 60,000. Now what happens if the amount of consumers in the economy doubles? We will have to aggregate the two separate demand curves. I have found that the easiest way to do this is to solve for our original demand equation, and then divide the amount demanded by 2 (to show that it represents only half of the demand). Then we multiply both sides by 2 to get rid of the fraction and we are left with our aggregated demand function. q = 10,000 – P/10 which is our new aggregate demand function. q = 4,000 (note that you can get equilibrium price by plugging this amount into the new inverse demand function following the same steps as before). Which is our new equilibrium quantity given the additional consumers. This result is pretty cool because we simply doubled the amount of consumers and we were able to double our equilibrium quantity. Note that this is due to the fact that we have a horizontal marginal cost curve; if supply/marginal cost was upward sloping we would NOT see equilibrium quantity double. And solving for q will again give us 3,9000. We can find equilibrium price by plugging this value into our inverse demand function above.